The New York Daily News has today published an article ahead of legal proceedings to decide the future of Holy Cross African Orthodox Cathedral in Harlem, New York, scheduled to take place on Tuesday. Archbishop Peter Paul Brennan OCR OA, who is a senior bishop of the African Orthodox Church, is challenging the purported sale of the Cathedral in the Manhattan Supreme Court. He leads a campaign to keep the Cathedral open for worship and to build up the congregation there. The African Orthodox Church was established by Prince-Abbot Joseph III of San Luigi (Archbishop Joseph René Vilatte) in 1921. 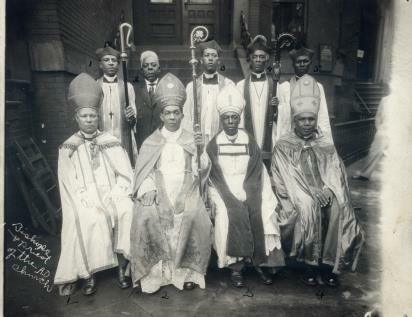 The photograph above shows Patriarch George Alexander McGuire with bishops and a priest at the foot of the steps of Holy Cross African Orthodox Cathedral.